Alphabet's (GOOGL - Get Report) Google has rolled out a new platform with a multi-cloud future in mind. At Google's Cloud Next conference in San Francisco, Sundar Pichai and a host of other executives in Google's cloud division, including the division's new CEO Thomas Kurian, walked an audience through Anthos, which is available starting today. Anthos is a rebuilt and rebranded version of the Google's Cloud Services Platform that it announced last year. Noting that 88% of enterprises plan on using a multi-cloud strategy -- in other words, using different clouds for different use cases -- Google Cloud's new CEO Thomas Kurian presented Anthos as the best possible solution to the problems that face companies and their CIOs. "This simplified solution allows our customers to train their developers on one technology and be able to run, secure and manage workloads consistently across clouds," Kurian said of Anthos, which is entirely software-based. According to Kurlan, Google's approach embraces "open standards" that make it possible to bridge Google Cloud with other providers such as Amazon's (AMZN - Get Report) AWS and Microsoft (MSFT - Get Report) Azure. Alphabet shares were down 0.6% to 1,200.73 on Tuesday afternoon, and are up about 15% so far this year. One of the main features of Anthos is the ability to manage different data center environments -- including AWS, Azure and Google's own Google Cloud -- along with on-premise infrastructure, all from one Google Cloud terminal. "Most companies have a multi-cloud strategy, but Anthos is the only one that helps you achieve that," said Jennifer Lin, engineering director at Google Cloud. Google also brought onstage a number of executives from partners and customers, including VMWare (VMW - Get Report) , Intel (INTC - Get Report) , Kohl's (KSS - Get Report) McKesson (MCK - Get Report) and Chase (JPM - Get Report) , to illustrate one of its other selling points: Industry-specific solutions that respond to the needs of particular industries, such as security, compliance or speed. Google Cloud has lagged behind AWS and Azure in the growing cloud market. As of the fourth quarter last year, Amazon had 32.3% market share, followed by Microsoft's 16.5% and Google Cloud's 9.5%, according to Canalys. And with the market still growing at a fast clip -- cloud spend also increased 46% annually in that quarter -- the stakes are high. "Google is a distant third in cloud revenues, so they had to bring in something unique, like multi-cloud capabilities, giving enterprises the abilities to move apps across AWS, Azure, Google, and IBM. This is what enterprises want," said analyst Patrick Moorhead of Moor Strategy & Insights. 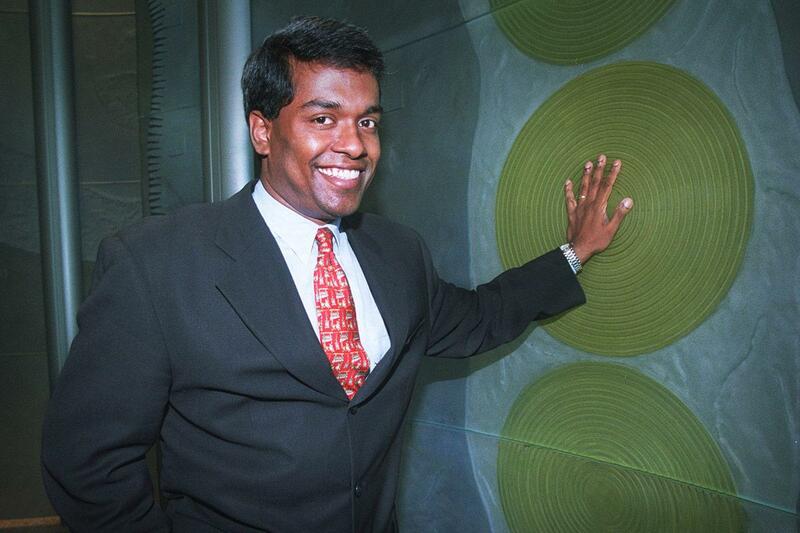 Kurian took on the role of Google Cloud's chief in January 2019, after working for 22 years at Oracle (ORCL - Get Report) , and joining Google shortly after Google Cloud's former CEO Diane Greene left. Kurian's Oracle pedigree is notable because, according to a WSJ profile of the new cloud boss, a big part of Kurian's role will be to aggressively spin up a sales division to get Anthos to as many hands as possible. Google has been criticized for focusing too much on the development of its tech in its cloud division and not enough on getting the platform out into the market more widely. Google still has an uphill climb ahead to sell customers on the multi-cloud promise and catch up with competitors, Moorhead added. "The promise is huge, but is very, very hard and it does lock enterprises into Google abstractions. I believe it will take Google a big effort to show how multi-cloud can be secure and simple," he said. Apple, Alphabet, Amazon, JP Morgan and Kohl's are holdings in Jim Cramer's Action Alerts PLUS Charitable Trust Portfolio. Want to be alerted before Cramer buys or sells these stocks? Learn more now.